Gold Coast Tiger Bay Club Luncheon is featuring a debate among the candidates for Boca City Council, moderated by former Boca Chamber president Mike Arts. 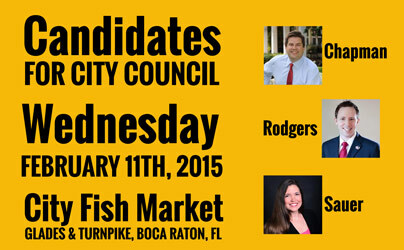 Candidates invited to participate are Jamie Sauer, Jeremy Rodgers, and Frank Chapman. The municipal election will be held on March 10, 2015. City residents can opt to Vote By Mail by requesting an Absentee Ballot, online, from the Palm Beach County Supervisor of Elections, Susan Bucher, at https://www.pbcelections.org/genericform.aspx?id=5 or by voting, in person, on March 10th. Early Voting will NOT be offered for the municipal election. The winner of the election for Council Seat C will be sworn in (along with Robert Weinroth, elected unopposed) on March 31st and join Mayor Susan Haynie, Council Members Michael Mullaugh, Scott Singer and Robert Weinroth for the Organizational Meeting, immediately thereafter.